The Chicago press was manufactured by the Sigwalt Company of Chicago. 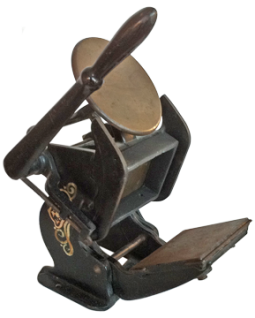 John Sigwalt manufactured a number of presses that were near-copies of some of the popular presses of his time. His presses were made from the early 1900’s until around 1962. This press was made in an even smaller size. The Chicago No.15 has a 1 1/2″ by 2 1/2″ chase. For more information about the Sigwalt Company see the Chicago No.10.